The importance of guest room and hospitality solutions is catching nationwide attention and coverage, including a recent article in The New York Times on hotel energy usage trends. When The New York Times needed experts to weigh in on what’s currently making waves in hospitality solutions and where the industry is headed, they turned right here to Leviton! As a company, we’ve been talking extensively about the importance of advanced energy controls in hospitality applications, especially in light of ASHRAE 90.1, 2012 IECC and Title 24 requirements. All three of the major United States energy standards require some level of energy management technology installed in guest rooms. 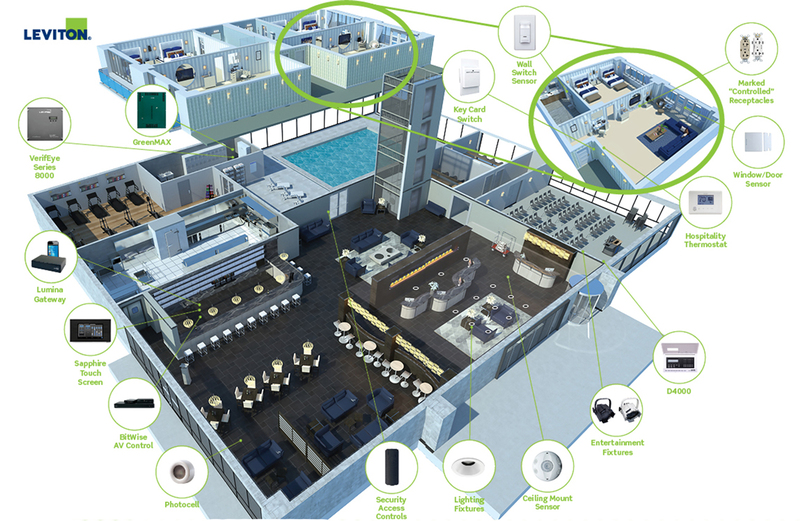 The Leviton Lumina RF Eco-System was designed with the needs of hospitality applications in mind, in order to meet energy code requirements for ASHRAE 90.1, 2012 IECC and Title 24 while maintaining a seamless and comfortable guest experience. With Lumina RF’s wireless hospitality thermostat and the Leviton key card switch, installation is simple and low-cost, and an entire resort’s worth of guest rooms can be retrofitted in a fraction of the time a traditional system would take to install. Working with Lumina RF wireless door/window sensors, occupancy sensors, motion sensors and the thermostat’s own built-in occupancy sensor, the thermostat’s logic can turn lights off when a guest is exiting a room, dial down the temperature, turn off the TV and more. Upon return, the room will re-activate. Free software allows rooms to be quickly replicated via a micro-USB connector for easy deployment and installation of multi-room properties. The key card switch offers similar control of temperatures, lighting and energy loads by requiring a key card inserted to activate the room out of vacant energy-saving mode. This ensures that energy is only used when guests or staff are present. Give your guests the comfort and ease of checking into an effortlessly comfortable space with the Lumina RF Eco-System. The ease of use is sure to score bonus points and repeat stays, all while ensuring you stay in compliance with codes and standards. To learn more, visit leviton.com/guestroomcontrols.